LOCATED IN LINCOLN SQUARE, WASTENOT COMPOST IS CHICAGO'S FIRST ZERO-EMISSIONS COMPOST COLLECTION SERVICE FOR HOMES, BUSINESSES, AND EVENTS. Miscommunication turned dream for WasteNot founder and CEO, Liam Donnelly. At the age of 15, while working at a local cafe, Liam saw that waste was an afterthought. Knowing that his beloved cafe could do better, Liam began to take food waste as well as coffee waste home out of guilt to compost in his backyard. After the general manager noticed Liam's passion for sustainability and his entrepreneurial spirit, the cafe began paying him for food scrap diversion. Lauren, a classmate in Liam’s environmental science class, learned of his composting efforts and helped him realize that his composting efforts would allow both of them to combine their passion for business and love of the environment, all while helping Chicagoans compost. From there, WasteNot Compost was born. WasteNot Compost currently serves homes and all business types ranging from schools, cafes, bakeries, to farmers markets, and everything in between. We take the work out of composting for you so it can not only be easy to do so in an urban setting, but always clean with all tools provided every pickup. 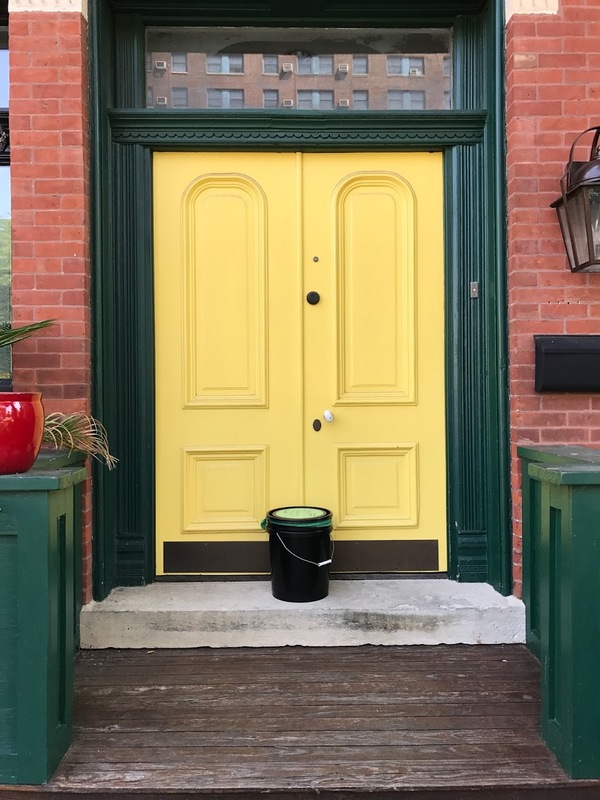 WasteNot’s residential service allows Chicagoans without the time, space, or desire to manage a compost bin, to still compost at home in the cleanest, easiest, and greenest (with zero-emissions) way possible! To start, we supply you a 5-gallon bucket, compostable liner, and an air-tight lid. Your bucket comes back cleaned with a fresh compostable liner with every pickup. All we ask is that you throw your compostable waste in your bucket and set your bucket out on your scheduled pickup day. It’s easy. Let us get dirty! Bi-annually, WasteNot residential members of three months or more can receive back the finished compost they helped create. Biweekly: Our most popular service! Weekly: For large families or those who love to cook. Biweekly (every other week): $12/pickup. Don't see your neighborhood serviced? Not sure about signing up? Click here! Commercial composting can seem like a daunting task. With WasteNot, we ensure that this isn't the case. We specialize in creating a specific composting program to suit your business or organization's needs to ensure maximum landfill diversion and operational efficiency. Not only do we design you a unique program, we supply your business with the necessary receptacles and aid in implementation such as staff education. Looking to differentiate yourselves from the competition? Trying to connect with a new target audience? Looking to develop a more sustainable brand? Whatever the reason, all commercial clients at WasteNot receive the benefits of green marketing, making being more sustainable viable. Impress your customers with how much your business or organization has diverted from the landfill with our diversion reports. Tracking every pound you've composted not only will be great for marketing, but offer you peace of mind that you are creating and a part of a closed-loop sustainable food system. We help you not only say that you compost, but also gain recognition for your sustainable efforts through waste reduction. This not only offers a showcase to all customers passing by your place of business, but validates what you are contributing and doing for your community. Simply PUT: If It Grows, It Goes. Just a few things: liquids, excessive oils/fats/grease, pet droppings, and recyclables such as glass, metal, and plastic. If you're ever unsure what can go in your bucket, send us an email (and a pic if you'd like)! Email us at: Lauren@WasteNotCompost.com. Have more questions? Have any concerns? We're here to answer all of your composting needs. Email: Lauren@WasteNotCompost.com or reach out to us on our social media platforms posted below. A WasteNot team member will contact you shortly. Have some questions Prior to signing up? Request more info! Fill out the form below by to requesting more information and we'll get back to you ASAP! Keep up-to-date of our composting adventures around the city by following us on the WasteNot Instagram! WasteNot Compost is growing and always looking for talented and passionate individuals to join our team. This is a unique opportunity for you to join a team who cares about what we do, each other, and most importantly, our community (while having fun!). If that sounds like you and you think composting is cool, we'd love to have you. LET’S CONNECT & COMPOST TOGETHER.